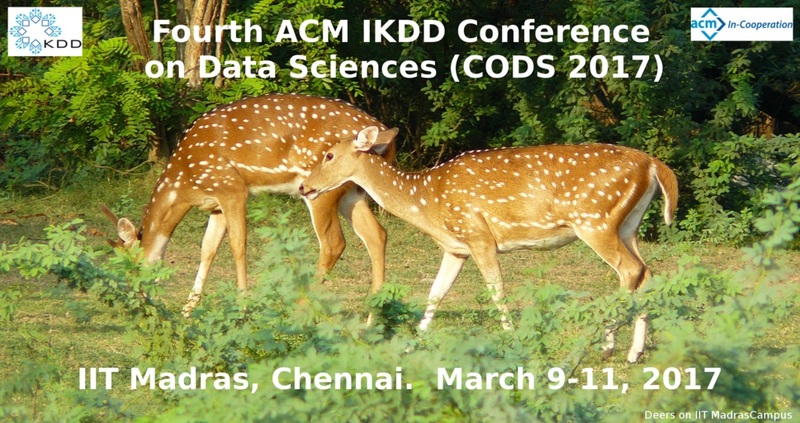 [February 17, 2017] : CODS 2017 invited speakers - Soumen Chakrabarti (IIT Bombay), Lise Getoor (UCSC), Srini Parthasarathy (OSU) and Ruslan Salakhutdinov (CMU). [February 4, 2017] : Registration are open and more information available here on registration page. [February 3, 2017] : Applications are open for Student Travel Grant. Please apply here. [January 20, 2017] : Industry Track accepted papers announced. Please see here. [January 11, 2017] : Registration information will be available soon, stay tuned!!. [January 03, 2017] : New Data Challenge statement released, check Data Challenge Page for more details.